"The aim of the building is to provide a restful retreat for relatives and friends spending long hours at the hospital, with someone who is approaching the end of their life. 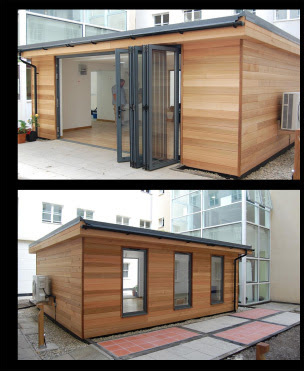 The Garden Escape successfully linked the new garden room to the existing hospital in the courtyard." Matron Sue Hall, Project Leader, said: "Whilst Barnet Hospital is a lovely modern building, there really isn't anywhere for families or friends to go for a bit of a rest from long hours spent at the bedside. We wanted to create somewhere very special, but private and peaceful. We've been really touched by the generosity of people who have helped us achieve so much already." Ever topical - that is why this blog is so worthwhile!